These Moroccan cookies take their name (halwa dyal makina or halwate el makina) from the traditional method of shaping the dough by passing it through a manual meat grinder fitted with a large fluted tip. Good results can also be achieved by piping the dough with a pastry bag or cookie press. Dipping the ends in dark chocolate is an optional but recommended step, as the unadorned biscuits might otherwise be considered bland. I've also seen the cookies decorated with nonpareil balls or silver dragees, or shaped into rings. I've halved my sister-in-law's traditionally large batch. Her recipe calls for some corn flour (corn starch), which lightens the texture a bit. You can use all flour if you prefer. For a richer cookie with delicate shortbread texture and buttery flavor, try the Viennese Biscuits with Chocolate Recipe. By hand or with a mixer, beat the eggs, sugar and oil until thick. Beat in the vanilla (or zest) and salt, and stir in the corn flour until smooth. Mix in enough flour to form a somewhat stiff but pliable dough. Line two large baking trays with parchment paper. Feed the dough through a large fluted tip attached to a manual meat grinder, pastry bag or cookie press. Use scissors to cut the dough into 2-inch strips (I like to gently twist the dough) and arrange the sticks fairly close together on the lined trays. Preheat your oven to 350 F (180 C). Bake the cookies, one pan at a time, for about 15 minutes, or until lightly colored. Carefully transfer the parchment paper with cookies to a rack to cool. In a bowl set over a hot water bath, or in a small bowl in the microwave at half power, gently melt about two-thirds of the chocolate. Continue heating the chocolate, stirring frequently, until it's very warm to the touch, about 114 to 116 F (46 to 48 C). Remove from the heat and stir in the remaining chocolate until smooth and cool. Very briefly heat the melted chocolate again, to return it to a temperature of about 88 or 89 F (31 C). 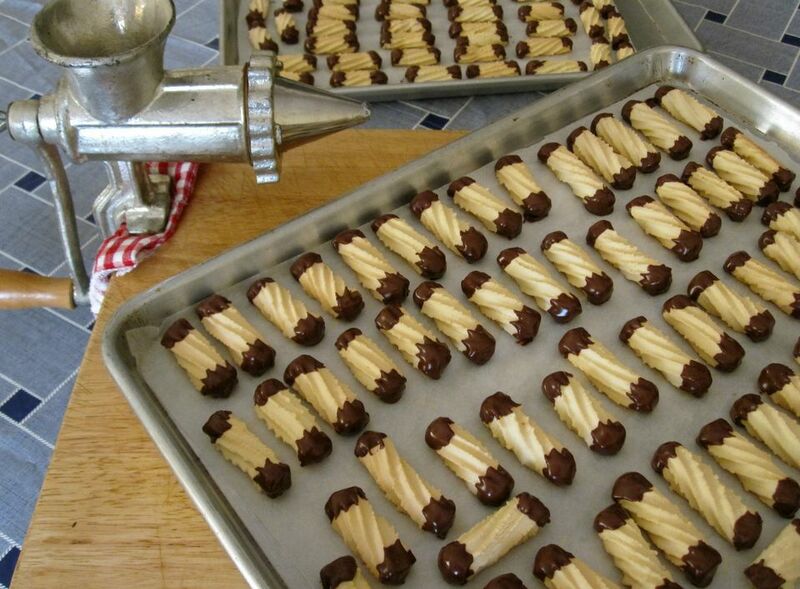 Immediately dip the ends of the cookies in the tempered chocolate and place the cookies back onto parchment or waxed paper. When the chocolate has set, transfer the cookies to an airtight container for storage. The cookies will keep for several days at room temperature, or for up to two months in the freezer. Thaw frozen cookies at room temperature in their unopened container.